What is an Excel Drop Down List? An Excel drop down list is a data validation function that allows users to select an option from a list of choices. It can be particularly useful in performing financial modelingWhat is Financial ModelingFinancial modeling is performed in Excel to forecast a company's financial performance. Overview of what is financial modeling, how & why to build a model. A 3 statement model links income statement, balance sheet, and cash flow statement. More advanced types of financial models are built for valuation, plannnig, and and analysis by incorporating scenariosDynamic Dates, Sum, Average and ScenariosLean how to create dynamic dates, sums, averages, and scenarios in Excel. For financial analysts in investment banking, equity research, FP&A and corporate development, it is advantageous to learn advanced Excel skills because it makes you stand out from your competitors. In this article, we will go through some of the and making a spreadsheet more dynamic. Learn to build dropdowns into models in CFI’s Advanced Excel Course. Make a vertical list of options you want users to be able to choose from. As you can see in our simple example, we have created a list of cities from around the world. Pick a cell where you want the Excel drop down list to be located and use the ribbon to access the Data ValidationData ValidationData validation in Excel is an existing and accessible tool to ensure data integrity while building a financial model. 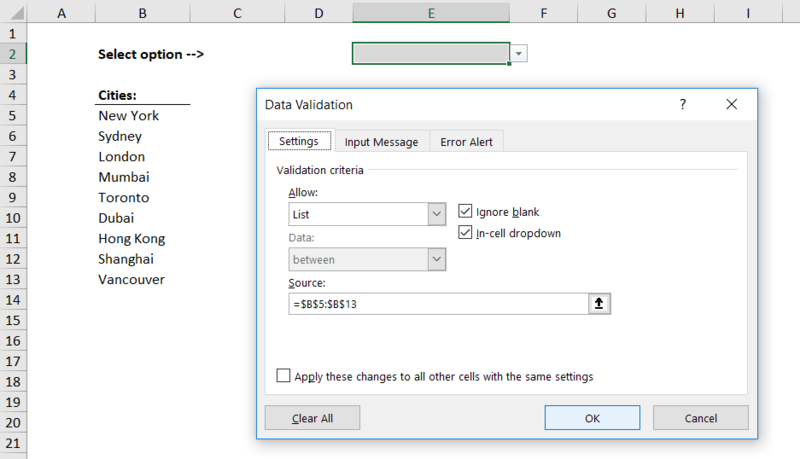 Although it is only an easy extra step, data validation in Excel is an extremely useful tool to secure your model inputs and outputs. function, which is located on the Data ribbon. The keyboard shortcut on a Windows computer is Alt, A, V, V.
When the data validation dialogue box appears, you will need to select “List” where it asks you what you want to “Allow” in the cell. Once that is done, you can select the data you want to include as the options that will appear in the list. In our example, the options are the cities listed in cells B5:B13. Then press OK, and your setup is complete. Learn more step-by-step lessons in CFI’s Advanced Excel Course. You may wish to change the background color of the cell that contains the list or add a border to it so users can easily identify it. When you’re done, start playing around with the cool new feature you’ve created! In financial modeling and valuation, an Excel drop down list can be very useful for creating scenarios that run through the model. In CFI’s financial modeling courses, there is commonly a set of scenarios that a financial analyst will use to compare different alternatives for a business. In the example below, you can see how using an Excel drop down list makes it easy to toggle between the base case, upside case and downside case. The model then uses the CHOOSE functionCHOOSE FunctionThe CHOOSE function is categorized under Lookup and Reference functions. It will return a value from an array corresponding to the index number provided. The function will return the nth entry in a given list. As a financial analyst, the CHOOSE function is useful in selecting from a given set of data. For example, we to flow the numbers through the model. Thank you for reading CFI’s guide to using an Excel drop down list to make your Excel models more dynamic. To continue advancing your career as a financial analyst these additional resources will be helpful. VLOOKUP FunctionVLOOKUPLearn VLOOKUP the easy way with screenshots, examples, detailed break down of exactly how the formula works in Excel. Function =VLOOKUP(lookup value, table range, column number). For example, “look for this piece of information, in the following area, and give me some corresponding data in another column”.